Poecilia Libestes Reticulata, a fish commonly known as the Guppy, is a very popular aquarium fish. It is particularly suitable for novice aquarists since it is easy to keep and non-aggressive. 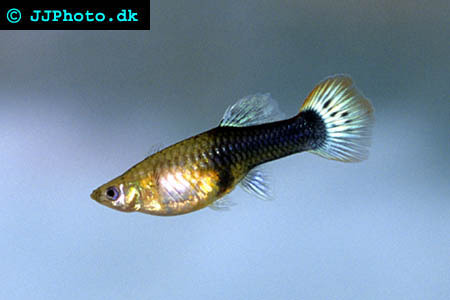 The Guppy belongs to the Livebearer group and will give birth to free swimming fry instead of laying eggs. The Guppy originates from fresh and brackish waters in South and Central America, but can today been found wild in other places of the world as well, including Florida in the U.S. The Guppy has been deliberately set free in several Asian waters in an attempt to combat malaria by decreasing the number of mosquitoes. You can choose between numerous Guppy fish variations, differencing in the shape of the body as well as the colour of the fish. The most common colours are red, green and blue. Guppy variations include Veiltail guppy, Lacetail guppy, Lyretail guppy, Flagtail guppy, Bottom and Double swordtail guppy, Long fin guppy, Fantail guppy, Red tail guppy, Triangle tail guppy, Rounded guppy, Fancy guppy, Tuxedo guppy, Glass guppy, Grass guppy, Mosaic guppy, King Cobra guppy, Snakeskin guppy and Peacock guppy. Guppies are often kept in community aquariums since they are so peaceful. They do however prefer to be kept in species aquariums, since other fish occasionally assault them by nipping their long fins. When several Guppies are kept together they will form a beautiful school. A Guppy fish can be kept in a 2 gallon aquarium, but the Guppy should ideally not be kept alone and larger aquarium that can house several Guppies is preferred. You will also need basic equipments: a heater and a thermometer to keep the water temperature stable, a filter to ensure good water quality, a fish net to use when you need to move your Guppy, an algae scrubber to keep the aquarium clean, and an air stone or similar to keep the water high in oxygen. Decorate the aquarium with plants, since the Guppy fish will feel better and experience less stress when provided with hiding places. You can also use rocks, branches and similar to decorate the aquarium. The bottom of the aquarium should be covered with gravel. You can buy a dechlorinating chemical from your fish store to remove harmful chlorine from the tap water. Your Guppies will do best if you keep the water temperature between 75 and 85 degrees Fahrenheit in the aquarium, and the pH between 6.8 and 7.6. Guppies should be fed once or twice a day. It is very important not to over-feed your Guppy. All food should be consumed after just a few minutes. If not, you are feeding your Guppy to much food in one serving. You can buy flake food specially made for tropical fish, such as the Guppy in your fish store. A flake food diet is a good base for the Guppy, but should ideally be supplemented with live food. Your Guppy will survive on flake food alone, but the live food makes the Guppy more well-nourished and healthier. Live or frozen Brine Shrimp is a popular Guppy fish food since Brine Shrimp is very easy to produce at home. Bloodworms, Micro Worms, Fruit Flies, Mosquito larvae, Daphnia and chopped up Earthworms are other examples of suitable food for your Guppy. 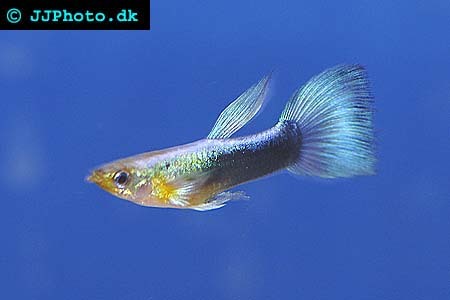 Guppies are easy to breed in aquariums and they will often spawn without any extra encouragement from their keeper. If you want to ensure a higher survival rate for the offspring, it is recommended that you place the expecting female Guppy in her own aquarium and let her give birth there. The mother Guppy should then returned back to her normal aquarium. A lot of Guppy breeders choose to include a so called breeder net in the small aquarium. The breeder net divides the aquarium into two separate areas, and only the fry are small enough to swim through the net. As soon as the fry are born, they will therefore be able to escape from their mother. When you set up the fry aquarium, a 5 gallon tank will be large enough. The water quality in the fry aquarium must of course be kept in supreme condition. It must be kept clean and look clear, and water changes must be performed at least 3 times a week. If you feed your fry live food you will probably have to change the water even more often. When mother has given birth, you can feed the fry Micro Worms, Infusoria, newly hatched Brine Shrimp, crushed tropical fish flakes or Liquid fry food. Guppy fry need to be fed more often then adult Guppy fish and four or five feedings a day is recommended. Wait until the fry are at least one inch long before you move them and let them and let them live with adult fish.